When you assign a record that you own or as a CRM Administrator you assign records owned by someone else to a third party you have a choice on what rights the previous record owner retains. When a/the record(s) is/are assigned, the new user or team becomes the owner of the record and its related records. The original user or team loses ownership of the record, but automatically shares it with the new owner. The CRM Administrator can decide for an organization whether records should be shared with previous owners or not after the assign operation. If Share with previous owner is selected, then the previous owner shares the record with all access rights after the assign operation. Otherwise, the previous owner does not share the record and may not have access to the record, depending on his or her privileges. For example if you re-assign ownership of the record to a person in an other business unit the previous owner of the record will only be able to see the record if they have rights to view and interact with records in the other business unit if you have turned the share feature off. If you haven’t even though they have access rights to the other business unit they will still be able to see the re-assigned records. Adjust this to fit your business requirements. 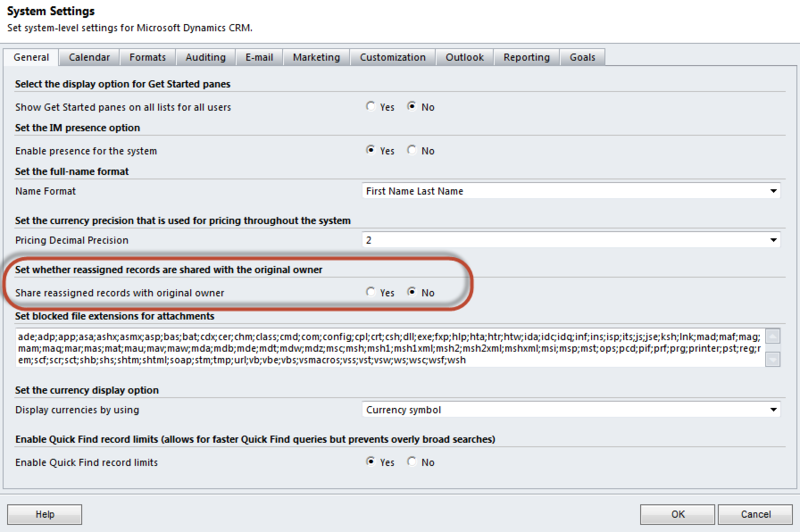 For you SDK geek enthusiasts the Organization.ShareRoPreviousOwnerOnAssign attribute controls this setting.